So what is the best Beatles’ album ever made? That has got to be the $64,000 question; and not since the arrival of Yoko herself has a topic created such discord among Beatles fans. Honestly, it is almost impossible to pick a favorite. How can anyone choose between Sgt. Pepper’s or Abbey Road? The White Album vs. Rubber Soul? 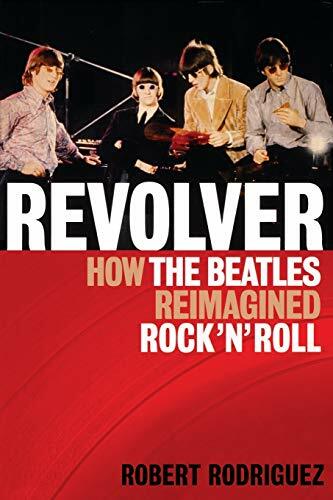 No matter where one comes down on the best album debate, it must be said that with his latest book, Revolver: How the Beatles Imagined Rock ’n’ Roll, Robert Rodriguez makes an impassioned and well informed plea for a landmark group of songs. Revolver is the seventh studio album in the Fab Four repertoire, finished well after the band had stopped touring. Their musical experimentation first emerged on the previous album, Rubber Soul, and it continued to evolve and develop through Revolver and into the monster that is Sgt. Pepper. Not having to reproduce the sounds live on stage gave John, Paul, George, and Ringo more freedom to find new and diverse ways to realize their musical ideas. The Beatles were at the point in their career where they had almost complete autonomy and money in the studio, meaning EMI let them experiment with whatever sounds captured their imaginations. Some of the more notable tracks on the album include “Taxman” (penned by George Harrison), “Eleanor Rigby,” “Good Day Sunshine,” and of course “Doctor Robert” (Lennon’s ode to his own Dr. Feelgood). The album took over 300 hours to produce and could not have been done without the help of innovative audio engineer Geoff Emerick and über-producer George Martin. The advent of Revolver also solidified The Beatles as a grown up rock ’n’ roll band. Gone were the matching suits, Merseyside sound, and screaming teenage girls (for the most part). Mr. Rodriguez chronicles the creation of a hugely influential rock album by mature musicians for a mature audience. It can be argued that without Revolver there would have been no Sgt. Pepper. With so much literature available of the Fab Four, one of author Rodriguez’s strengths is his approach. We all know that John enjoyed his chemical experiments, George embraced Eastern music, Ringo wanted to be a hairdresser, and Paul just wanted everyone to get along. Instead, by focusing on the creation and evolution of one specific album, the author is able to find a new story in a canon that feels older than time itself.